I’m currently working on a post about Popol Maya, a 1997 Japanese adventure game that has very little written about it. Its anonymity has caused some problems; I’ll usually reference a walkthrough when I’m stuck, but because of the language barrier, the only coverage about the game online fed through Google Translate keeps mentioning a “crab bicycle.” So that hasn’t been entirely helpful. But it did remind Jeremy Penner (friend of The Obscuritory) about a similar experience he had trying to play White Sun of the Desert, a game adapted from a popular 1970 Soviet film. It’s a very personal story about Penner’s relationship with the game during an uncertain period in his life. What got me was the end of his post, where he tries to figure out why he got so invested in figuring out this strange game. For Penner, it was about finding comfort in the seemingly bottomless well of questions it raises, the freedom of getting lost in an unexplained, buried corner you’ve never heard of – and recognizing that you could live your whole life without encountering it. Penner discovered White Sun of the Desert from its connections to the Soviet space program, which somehow led him deeper and deeper to this undocumented adventure game. White Sun of the Desert may not be a good game by his account, but good or otherwise, it’s a glimpse into another world. Who made it? Why did they make it? What is it about? And where do those answers lead next? That’s what lights me up about obscurities too. When you dig into something unknown, it can be the tip of a gigantic, interdisciplinary iceberg, a gateway to spheres of knowledge and culture that you wouldn’t cross paths with any other way. Engaging with an unturned stone can send us down avenues we never expected. It broadens our understanding of how much there is in this world, how we can always still learn more about it, and what we’ll discover with a curious, open mind. For Windows 3.1 games, the interface quirks, like the reliance on a bulky WinHelp file to explain the game, are part of the appeal. Windows 3.1 wasn’t well-suited for action games – many developers continued using DOS instead until Microsoft improved the operating system’s graphics support – and the games carved out what they could in a format that wasn’t really designed for them. Of course, nothing about that makes Why Did the Chicken Cross the Road an improvement on Frogger. The game’s stuttering, halting movement significantly reduces how easily your chicken can dodge cars… or spaceships or dirt bikes or airplanes or whatever, depending on the stage. StupidSoft clearly had a lot of fun making this. Instead of a registration fee, they wanted fans to send them postcards. They have an infectiously good spirit. Joe the Chicken is just glad to be here. There’s nothing new to the idea that, in a world overrun with grotesqueries, humans may be the real monsters. 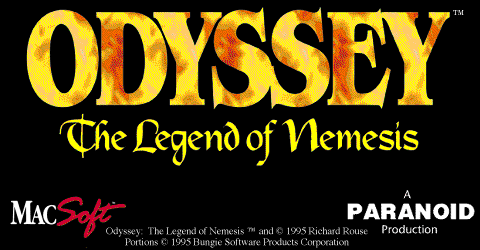 Odyssey: The Legend of Nemesis, a role-playing game for the Macintosh, brings a level of specificity and empathy to that concept. Rather than swing into allegory, Odyssey roots its big ideas and moral choices in the lives of individuals.